Fire emergencies can create great destruction to life and property. Understanding the potential damage they can cause to a company, its assets and occupants, it is necessary to have sound fire protection systems. Select Plumbing has delivered efficient and state-of-the-art Fire Protection sprinkler systems to their clients in Toronto. Select Plumbing and Heating is highly experienced with fire protection systems. Our in-house team of experts are skilled in sprinkler system design and modifications, including sprinkler head transfers and additions. In addition, we’ve installed and modified standpipe systems such as fire hose cabinets and associated piping and repaired leaky sprinkler and standpipe systems. We have both designed and modified sprinkler and standpipe systems in a variety of commercial properties including office towers, industrial spaces and factories, residential multi-unit properties, hospitals and more. We ensure quality throughout every step of the installation of the fire protection systems. The professionals observe complete care during the engineering, design, supply, installation and maintenance processes. 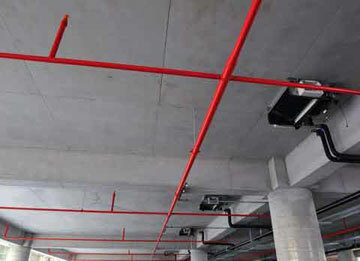 The installation of the fire sprinkler systems is both cost-effective and high-quality. The experts strive to deliver installation meeting the time scale and budget of an individual following the regulatory code standards. We also provide repair and maintenance services for the existing fire sprinkler systems. For emergencies, we are available at the tick of a clock to react to any potential fire danger. You will have an absolute peace of mind knowing that the fire sprinkler systems installations are customised to meet the clients need and the infrastructural needs of your building. Select Plumbing in Toronto takes pride in serving customers for many years. Our friendly and fast turn-around members are always ready to provide well-intention fire protection solutions. We will be happy to serve you at any time you want. If you’re looking to have your fire protection systems installed or modified effectively, efficiently, and in a cost-efficient manner, look no further than the plumbing team at Select. Call 1 888 501 5501 or 905 501 5501 today.